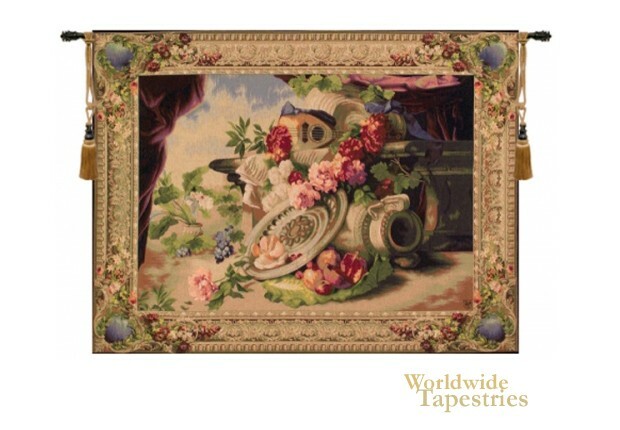 Mandolin tapestry shows a floral still life scene of flowers and mandolin in the countryside. This French tapestry shows the beauty of music and flowers though the mandolin among platters and flowers set near an ancient stone ledge in the natural countryside. The placement of flowers in the natural surrounds of the countryside was a technique used by artists for centuries to enhance the beauty of their main subjects. A crimson drape accompanies the scene. This French floral tapestry "Mandolin" is backed with a lining and has a tunnel for easy hanging. Note: tapestry rod and tassels, where pictured, are not included in the price.